The much-awaited teaser of Akshay Kumar and Rajinikanth’s 2.0 is finally out. The most expensive Indian film ever, it marks Akshay’s debut in the Tamil film industry. A S Shankar directorial, it is the sequel to the 2010 blockbuster Enthiran (Robot), which starred Aishwarya Rai Bachchan and superstar Rajinikanth. A VFX extravaganza, the teaser is a visual delight. It brings back ‘Chitti’ the robot. 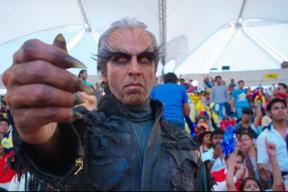 To add to it, Akshay Kumar’s Crowman will leave you stunned. Now that the teaser is out, it wouldn’t be hyperbolic to say that 2.0 is sure worth the wait.